Fast Shipping Within the US and Canada! The ladies on our production floor are working hard, and we currently have inventory. All orders leave our Canadian (Ottawa) or US (Ohio) warehouse within three business days. 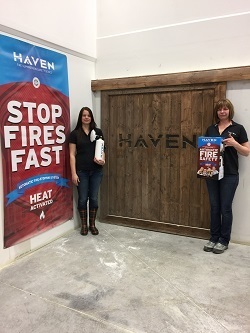 The Haven automatic fire safety device is 5-year set-and-forget fire safety for your loved ones. 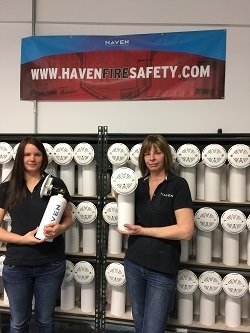 The Haven provides a safe haven for you and your family by automatically discharging a heat-activated MSDS-safe super-fine mix of ABC dry chem at operating temperatures of 135 degrees Fahrenheit. Painstakingly engineered and re-engineered to be easily and discreetly installed in most ceiling cavities (recommended for egress areas such as bedrooms, hallways and all paths out of the home). Additional units can be installed for added protection in areas such as kitchens, playrooms, garages, hunting camps and anywhere you want added, automatic, protection. Tested and proven to provide effective suppression into a 16′ x 16′ area by suppressing flame and fire providing life-saving time for egress. We ship via Canada Post and UPS typically within 3 business days during normal periods. If there is something wrong with the unit when you receive it, please email us right away and we will promptly send you a replacement unit and a return shipping label to send us back the defective unit. This is very rare, but we stand by our products and will make it right, quickly.